The front of Bill Freehan’s 1977 card projects the feel of an iconic solidity gone slightly out of whack, like an old, eroding statue jarred askew by geologic forces. By the time the card came out, Bill Freehan, an eleven-time all-star, had been released. In what would be his final season, 1976, the plan seems to have been to go with someone other than Freehan as the team’s primary catcher for the first time since 1962. Detroit’s April 20 road game against the Oakland A’s marked new acquisition Milt May’s sixth start of the season, against just two starts for Freehan. Late in that game, however, May suffered a season-ending injury. Freehan entered the game in the bottom of the eighth with the Tigers holding a two-run lead. The A’s managed no runs in the eighth, despite pinch-runner Larry Lintz (manning the A’s pinch-runner role once held by Herb Washington) reaching second on a steal, but in the ninth inning the A’s (who would set a modern record for stolen bases that year) began wreaking more havoc with their legs. Bert Campaneris reached on a single and stole second, which may have rattled starter Joe Coleman into walking Phil Garner, especially given that Coleman was then removed from the game for Joe Crawford. The A’s, incredibly enough, carried two players that year that they used primarily to pinch-run, and the second of these players, Matt Alexander, was inserted for Garner. Alexander and Campaneris promptly executed a double steal, putting the tying run in scoring position. By this point, you’d have to think that Bill Freehan, a former five-time Gold Glove winner who had earlier in his career once led the league in percentage of runners thrown out trying to steal, was feeling sweaty, bewildered, even besieged, having surrendered four stolen bases in the time it would have taken a fan to go get a hot dog. The Tigers got a brief reprieve when Billy North lined out, but then Crawford walked Claudell Washington and Joe Rudi smacked a single to tie the score. Crawford was yanked from the game. And here, on the day when Bill Freehan regained his starting role, another story begins. A curly-haired 20-year-old Tiger rookie making his major league debut bounded in from the bullpen. Bill Freehan must have been at the mound to greet Mark Fidrych to the big leagues. Maybe he even slapped the ball into Fidrych’s glove. All I can tell for sure is that Bill Freehan was behind the plate when Mark Fidrych started what would be one of the most magical individual seasons in major league history on a sour note, surrendering a game-ending single to the first batter he ever faced, Don Baylor. 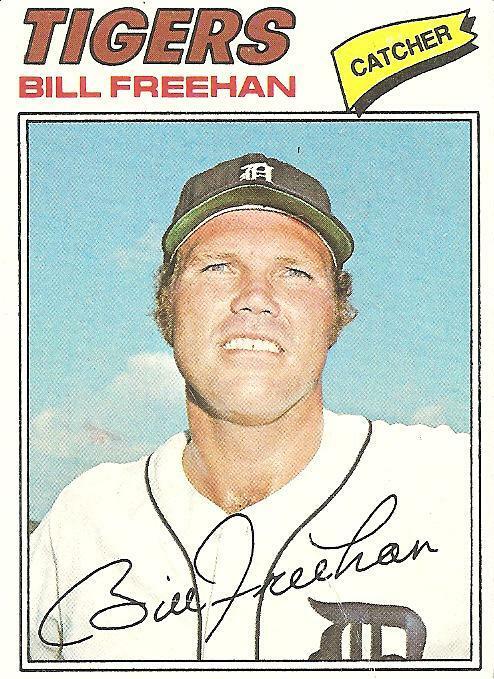 Bill Freehan caught Fidrych in his next game, too, another brief relief appearance, this one in ninth inning mop-up duty in a loss to the Twins. The appearance went a little better for Fidrych (no runs and two hits in 1 inning of work) but was no highlight reel for Freehan, who let one of Fidrych’s lively offerings get by him for a passed ball. Kimm, Johnny Wockenfuss, and Bill Freehan divvied up the catching duties in something close to an even three-way split, but in the end Bill Freehan once again topped the team in games played behind the plate [update: though Freehan is listed with the starters on baseball-reference.com’s page for the 1976 Tigers, Kimm actually matched him in games caught, 61, with Wockenfuss right behind with 59, accoring to Freehan’s SABR bio]. He hit .270 and added 5 home runs to his lifetime total for an even 200. His entire statistical record is on the back of this 1977 card, and there’s something satisfyingly solid about that even 200 number and about the repetition of one team and one team only, “Tigers,” down the left-hand column of the statistics. As for the dream that briefly overlapped Freehan’s, the one featuring the 20-year-old rookie with the curly hair, it didn’t last long, as an injury in spring training in 1977 started a chain reaction leading to chronic arm troubles for Mark Fidrych, who would, like Freehan, never be a regular again after 1976. Note to the 2011 Detroit Tigers: All that is solid will melt into air. How to enjoy the 2011 baseball season, part 10 of 30: Check out the posts of author Joe Bonomo at No Such Thing As Was, who recently added a recollection of the Bird in 1976 to his blog about (among other things) pop culture and memory. You are currently browsing the archives for the Bill Freehan category.